“We are all just pieces of clay.” A quote from my favorite poem, which helped carry me through some of the difficult periods in my life. To me, this is a good quote (and in a very humbling poem) which reminds you of a few things; (a) we were created by God (b) we are here temporarily living this life, and (c) one day to Him we shall all return. A few deaths have occurred this last month, none within my circle of family or friends but known to me via social media and friends’ updates or retweets. A 30-year old steward who slipped and fell at the jetty at Pulau Perhentian, hit his head and drowned unconscious while on holiday. A colleague’s ex-schoolmate, 33 years old, who died in a motorcycling accident on the way home to see his wife and daughter after a game of futsal. A friend of a friend who had delivery complications which saw both the mother and baby battling for their life overnight in the ICU, only for the mom to lose her child the next day. There are no words to describe the sadness. But my heart (and millions of other people’s) was touched particularly by Faris’s story, thanks to Bersama Mazidul blog. Faris was a 6-year old happy and active boy, the youngest child of Sham and Zuraine (they have 2 other children, 13 and 10 years old) until he was diagnosed with blood cancer. 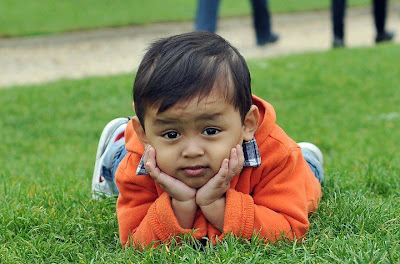 On Mazidul’s blog, there is a picture of him when he was healthy and happy, smiling into the camera while propping up his head with his hands at a park. Another picture last week showed the stark realities of his suffering – full oxygen support, tubes and attachments clinging to his body, tears streaming down his face. Truly, only Allah knows best why these things happen, because it is beyond our weak human intellectual capabilities to make sense of. Truly, we are all just pieces of clay. Two days ago Faris passed away. Pictures on the blog depict his mother sitting by his body, with her hands on his chest, talking to him. Another picture showed her outside the ward, crying softly while others surrounded her in consolation. His sister’s card to him, praying for him, urging him to get well soon so they can ride in cars together and play badminton. His father, eyes dry, tired but tenang and pasrah. Pictures of the prayer session and pengebumian jenazah, tempat arwah disemadikan selama-lamanya. He is the same age as my son Umar. It makes me think about the difference between the two boys, and the difference between my situation and Faris’s mother’s position. Why am I given the blessing of seeing my son in front of me, happy and healthy, Alhamdulillah, while hers has been taken away? It makes me realize that, indeed, all of us are properties from God and we are actually being loaned to this world. None of us have the right or the claim to a certain level of happiness, health and wealth. Whatever each and everyone of us have, is there due to the grace of God and nothing else. If He wished, we can all lose everything. Now. Tomorrow. Next year. Next 50 years. Wallahu’alam. You are at a better place, dear Faris. Cry no more. Al-Fatihah.